Callaway has changed the game in waterproof bags. The 15 Way top with full length dividers, has been redesigned to sit parallel to the ground, allowing club grips to sit flush in the bag. A TPE lined putter well keeps putter shafts from scratching. Stiff Fabric and weight are a thing of the past. 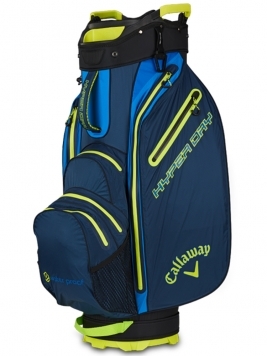 The new Hyper Dry Cart bag is made up of an Ultra lightweight 50 Denier coated fabric making it 50% more waterproof than previous models and 11% lighter than previous models. Each seam has been meticulously sealed to prevent any leaking into the interior of the bag and all zippers have been welded, keeping a strong secure seal. The Hyper Dry cart can withstand all conditions and weather with ease.